Private sessions are available at a location of your choice within three hours travel of the Tucson/Phoenix, Arizona area. Such sessions require an 8 dog minimum ($800.00). Private sessions with a single dog are available in the Oracle, AZ area for a minimum charge of $200.00 (the cost of 2 dogs). For your comfort, also bring a hat and sunscreen. This is an example of the easy, scent specific avoidance training outlined in the previous section. I do a lot of this work here in the West because snakes are an ever present danger to dogs. As with any avoidance training, it begins with the thing to be avoided. I use a live rattlesnake. The animal is de-fanged as a safety necessity. In the case of a snake, all three association sources, sight, sound, and scent are readily available for the dog. Snakes move so they are easy to see. They rattle and make a distinctive sound. They emit a distinctive scent that dogs discern easily. First, I define the training area. I set aside a safe staging area the dog identifies as snake free, safe ground. This is the area where his owners are waiting for him after each successive phase of the training. Secondly, I set aside the snake area where the dog will meet the snake. Then third, directly downwind from the snake area, I set aside a small, fallback, safe area to get the dog away from the snake during the initial introduction. Wind permitting, this small safe area is on the far side of the snake. The purpose of placing the snake between the dog and the safety of his owners is that he will have to go by the snake again to get back to mom and dad. I begin by placing an e-collar on the dog and hooking on a twenty-foot check cord. I make it a point to get the dog comfortable with me during this process. I greet the dog on his level by kneeling down or sitting with my back facing him as he approaches. I drape my arms down the sides of my body and make my wrist available for the dog to press his nose against. I let the dog approach me from behind and I do not make eye contact until after the dog feels comfortable and initiates eye contact. Finally, I give the dog my breath by breathing into his nose. I do this to fast track the introduction process and to allow me a chance to get a sense of the dog. I am looking for temperament and personality traits. I want to see if the dog is bold or standoffish. I am evaluating what level of stimulation will be necessary to get the desired effect with this particular dog. I have a helper place the snake on the ground at the predetermined snake area and then move off to the side so that he is out of the dog’s view. 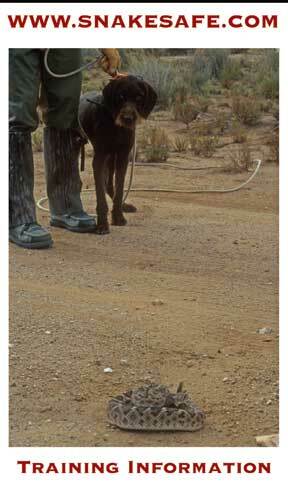 This snake wrangler stays close enough to monitor the snake’s position and keep the snake in place. The snake wrangler is there to make sure that the snake avoidance training session doesn’t turn into an impromptu snake hunt. Leading the dog on the check cord, I approach downwind of the snake and stop short at the predetermined small safe area, approximately ten to fifteen yards downwind from the snake. At that point, I stop and get down on the dog’s level. I talk and pet the dog. I give him my breath. I wait to see the dog relax. Remember, dogs are very place specific. I establish this spot as safe so that once the dog has been exposed to the snake and is in some degree of panic I can immediately get him to a safe position, calm him down and reassure him. Once the dog’s body language goes soft, he is ready for the introduction. I lead the dog upwind through the snake’s scent stream to the snake and wait for the dog to realize it is there. Of the three possible cues (sight, sound, scent) available to the dog, the first to get the dog’s attention is almost always sound. Dogs almost never see a snake and will step right over it unless the snake moves or rattles, and they don’t generally react to the scent until they know there is something there. I push the dog forward until he is at the snake and the snake responds to the dog’s close proximity with a warning buzz. At this point, the dog seeks to locate the source of the sound and sees the snake. Generally, one of three things happens. About 10% of the dogs tuck their tail and run the other way. Another 10% don’t blink or hesitate. They drop their heads and charge the snake to grab it, and never take the time to smell it while charging. The final 80% upon hearing and seeing a rattlesnake, stop any forward movement and look to use their noses, circling downwind of the snake to smell it. If the dog cuts and runs, I do not apply an e-collar correction. I wait until the second test. I just lead the dog back to its owners. If the dog is a member of the second group and charges the snake without taking any time to smell it, I do apply a correction. That dog then joins the 80% group which, upon hearing and seeing a snake, circle downwind to smell it. When all three associations are present (the dog sees, hears, and smells the snake), I apply a severe correction. I am looking to make a profound impression upon the dog. I often tell dog owners during the pre-training orientation that we are here to traumatize a dog for life. This is the intent of the training. We want it vividly etched in the dog’s mind that whatever this funny looking, funny sounding, funny smelling critter is, they don’t ever want to go near it again. I make this association with a stiff, short “bite” delivered by the collar. The e-collar is the ideal tool because stimulation literally feels like a bite. When muscle is stimulated by electricity, the muscle constricts and at the end of the stimulation the muscle slacks to its pre-stimulation tension. The neck muscles of the dog during stimulation feel like they are experiencing a bite. The level of the stimulation needs to be very stiff. Each dog is different, and one of the most difficult parts of avoidance training is guesstimating just how much will be necessary to attain the required impact. A professional trainer could do hundreds of dogs over the course of a year. As he or she meets each new dog, he or she has a very short window of lead time to make the determination of what level will be required for each dog. I always make it a point to err on the side of caution and start low. If I need to, I can reset the stimulation level at the transmitter and apply a stronger correction. The dog’s temperament, personality, and age all factor into the stimulation level choice. I time the delivery of the stimulation to reach the dog when the dog is closest to the snake. With experience, a trainer learns to gauge just how close the dog is willing to go and holds off applying the correction until that instant. I wait to give the dog all the time he needs to get as much of the three associations, sight, sound, scent, as he wants. This memory will need to last the dog’s lifetime, so an extra second or two of the initial contact is time well spent. After the correction is applied, the dog will never willingly go near another snake again.